Venezuela’s political crisis has taken another turn, with an opposition leader declaring himself interim president. Meanwhile, the family of one former Venezuelan military official who Nicolas Maduro accuses of being disloyal has been living in Canada. Venezuela's political crisis has taken another turn, with an opposition leader declaring himself interim president and demonstrators taking to the streets in a bid to oust the government of Nicolas Maduro. Juan Guaido, the Venezuelan opposition leader who swore himself in as interim president Wednesday, was quickly recognized as such by Canada, the U.S. and other nations, including Argentina, Brazil, Chile, Colombia. Bolivia, Cuba, Turkey and Russia, among others, have not followed suit and continue to back Maduro as the rightful president, accusing the U.S. and others of interfering in Venezuela's internal affairs. A major oil producer, Venezuela has been wracked by hyper-inflation, food shortages and intense crime since Maduro came to power in 2013. Maduro's government accuses the U.S. and others of launching an "economic war" against Venezuela, blaming them them for most of the country's problems. The move comes as opposition leaders call for Venezuela's military to turn against Maduro. And the family of one former Venezuelan military official who Maduro accuses of being disloyal has been living in Canada. "This is as dramatic a situation as any that I can think of," said Max Cameron, a professor of political science with a focus on Latin American affairs at the University of British Columbia. "It means that Venezuela has reached what appears to be a tipping point. A point at which the international community has now said that they don't see this government as having international legitimacy." Other experts question whether Canada's approach could do more harm than good. "I think in the case of Venezuela, the claim to the presidency by the opposition leader is uniquely thin," said Arnd Jurgensen, a political science professor at the University of Toronto. "For the most part, for a country not to recognize the existing government, is in many ways an interference in their own sovereign independence," he added. Jurgensen said Canada's strategy is risky. If the opposition doesn't take power, Canada will be left trying to deal with a government it has denounced as illegitimate. Colonel Oswaldo Garcia Palomo has been living in exile in Colombia, while his wife and adult children are in Canada. "I know Canada, they have a strong position when it comes to Venezuela," Garcia Palomo's daughter Fabiola told CBC. "They (Canada) already froze bank accounts (of leading government officials) and everything, so I think the position Canada has with Venezuela is very strong and they have been very supportive since the moment that the protests started in Venezuela." Fabiola, who was attending university in Montreal when her family fled Venezuela, said she would love to return to her home country. "If Venezuela is free, I would love to go back to my country because that's the place where I grew up, that's the place where I have my family and that's the place I dream to be in the future," she said. 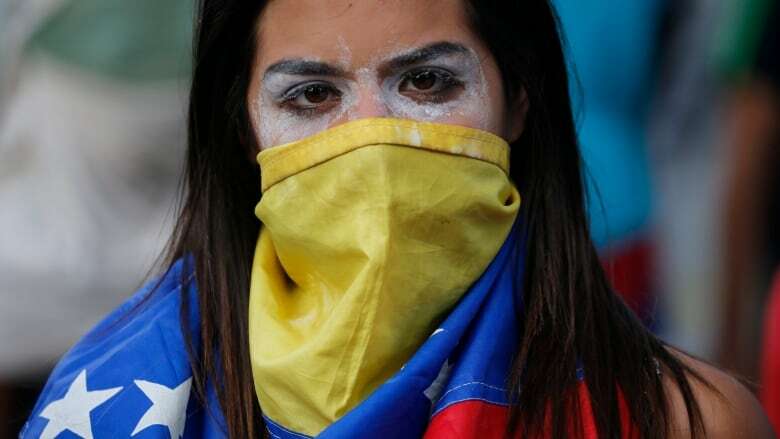 Sorbay de Padilla, Garcia Palomo's wife, said members of the military in Venezuela have taken an oath to defend the people of her country and should fulfil it. "My husband is on the right side of history. He is doing everything he can to fight for the freedom of Venezuela, so that we can get out of the dictatorship," she said in Spanish. 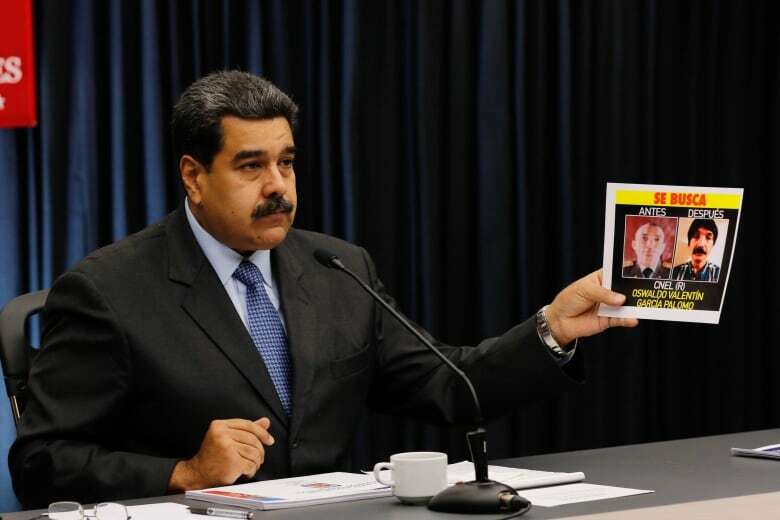 Opposition leader Juan Guaido used a video message to appeal directly to Venezuela's military to oppose the Maduro government, or at least remain aloof from the struggle now playing out on the streets. "We're not asking you to stage a coup d'etat, we're not asking you to shoot. On the contrary, we're asking you not to shoot us, to defend together with us the rights of our people," Guaido said. Maduro, who was first elected president in 2013 by a thin margin following the death of socialist leader Hugo Chavez, is deeply unpopular.